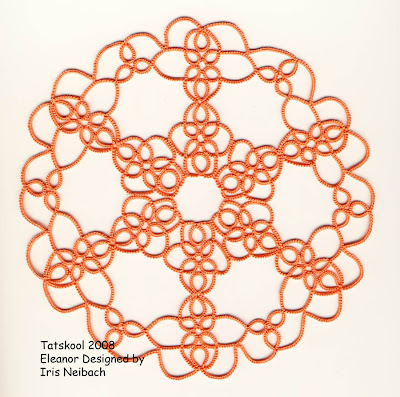 Finished my second Eleanora from Iris Neibach's Tatted Doilies. This time in a much much lighter version of my Coral Reef HDT. The turquoise green is much less green and altogether more subdued. This is so different from Coral Reef that I think maybe it deserves a name of it's own so I shall call it 'Blue Lagoon' if that name hasn't already been used. Kind of looks like a peaceful lagoon. I think it suits the pattern. The thread is Coats Mercer 20 and the doiley measures 7 inches. I think it took about 24 yds on shuttle 1 and 17.5 yds on shuttle 2, about 41.5yds in total. This is just to give you an idea if the amount needed, you may need more as I am a very tight tatter. There are a few tricky important shuttle changes in this one. A fair bit of untatting took place 'till I got the hang of the pattern. Whenever I tat a complex visual pattern I like to print out a diagram or a pale picture of the whole doiley. First I number the rings until I have covered the sequence and then I colour in the rings and the chains as I tat them, this saves me getting lost. Often I use different colours for the rings and chains and this gives me an idea of how it would look if I used different threads. For this doiley I coloured the two shuttles threads differently and after my trial tat it became much more obvious what I was doing and this second attempt was then relatively easy. Now I want to repeat it using different colours in the 2 shuttles and have dyed a darker green from Apple Blossom to give me more contrast. Hope it will look nice. Meanwhile I have started my next one from Iris's book...Cornelia. These doileys have me entranced. They are so different from previous encounters with doileys. 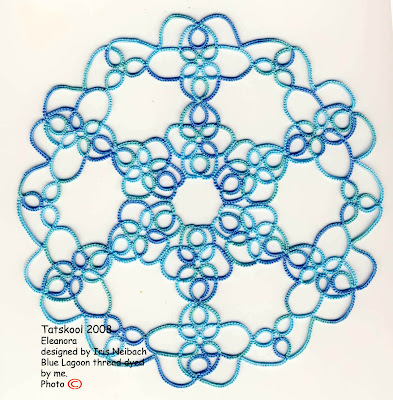 I don't normally post pictures of part finished items but this may take a long time and be of interest to others tatting the same pattern. 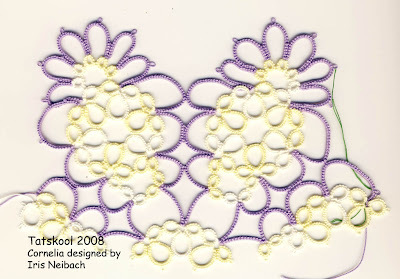 The thread is Flora 20 in lavender and in variegated very pale lemon and white. Am finding this pattern pretty straight forward, nowhere near as hard as it looked. Estimate of thread needed for the rings is approx 50 yds, so it may be touch and go with a 50 skein of HDT, hope it would be enough. Haven't estimated the chains yet. It will measure about 9inches. 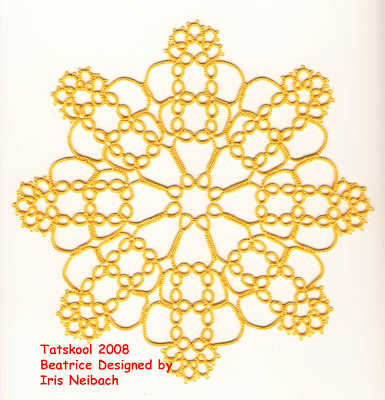 I am working my way through Iris Neibach's book of Tatted Doileys, inspired by Diane and Steph. I started with Beatrice as that looked to be the easiest. made it first in Flora 20. Next came Eleanor also in Flora thread. This one is a little more tricky. 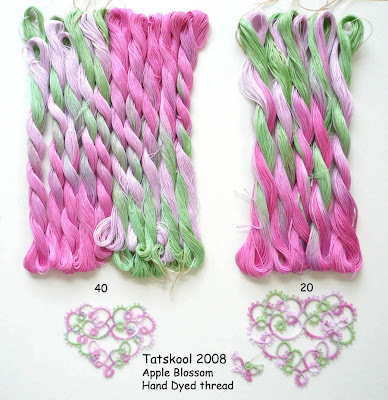 Now to make them both in my own hand dyed thread. Here is Beatrice in Apple Blossom batch 1 in size 20. The thread is Coats Mercer, a top quality 6 cord thread. The doiley took almost exactly one 50yd skein, I had just enough left (about a yard!) to tat a butterfly. It was touch and go at the end and a bit of shoe lace tricking had to be done. I do tat tightly so I am not sure if you would use more thread. It measures 8in in diameter. Eleanor measures less than 7in. My Apple Blossom thread disappeared like hot cakes before they have time to cool down, so did Coral Reef, thank you for you interest and confidence. Can't wait to see what you make with it. I have now dyed batch 2 of Apple Blossom, this time in size 40 as well as 20. There will also be sets of 3 solid colours in each size. This Apple tree set it's blossom slightly later that my first one and its blossom is slightly richer in colour! Impossible to show you the true colour, the doiley and the thread do look the same! The hearts in the photo show you the difference in the size of the thread. Sorry that they are blurred as the camera focused on the thread! Here they are in a scan. Life is getting in the way at the moment so Coral Reef restocking may take a short while. 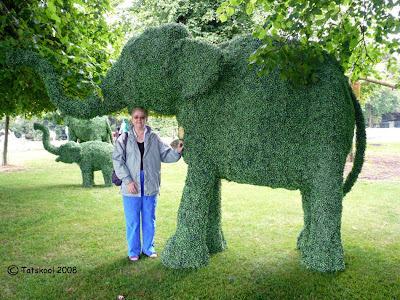 I promised you a green elephant and here it is. You waited a long time. 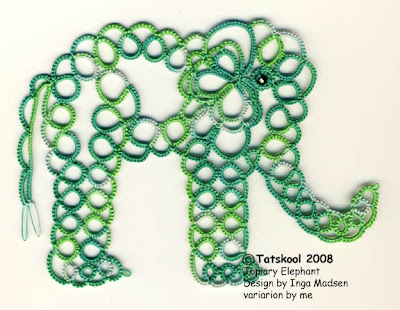 It was a lot faster to tat the green elephant than to write this post so I hope you enjoy it. I was pleasantly suprised at the response to my elephants and Dublin post, so many of you collect elephants and regard them with so much affection.....I suppose that's not suprising they are amazing. Do I here you asking 'Why a green elephant?' 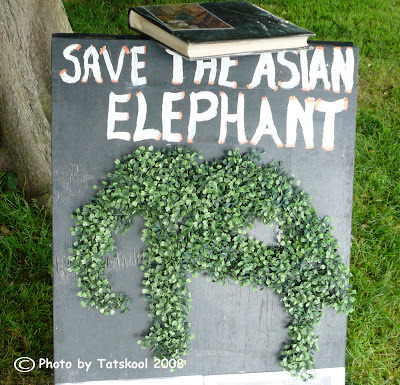 Well the answer is partly that it's a topiary elephant and partly that it's 'green' in a 'save the planet' context! The thread is my own hand dyed stuff. It was supposed to resemble box (Buxus) most commonly used for topiary..it wasn't quite as good as I would have liked but I wanted to do this this year not when I reached perfection!! 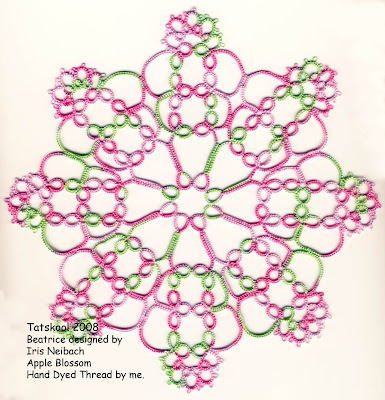 A little bit of trunk variation from Inga Madsens wonderful pattern. 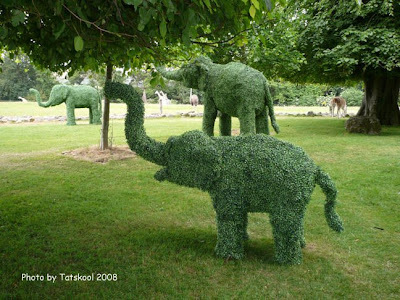 So now you should be wondering why a topiary elephant can help save the planet...or the elephants that live on it at least. 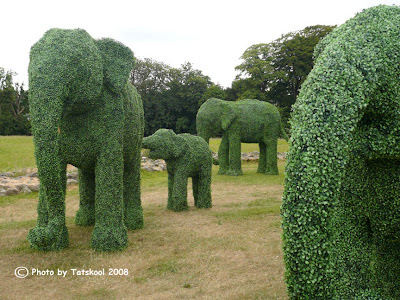 The story begins earlier this year when two Americans (Topiary Joe) flew over to the small West Cork town of Clonakilty to build a herd of life size elephants. 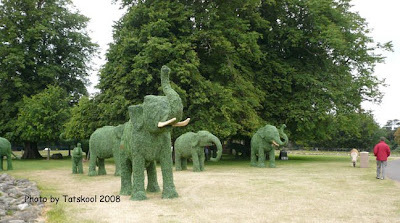 The three dimensional elephants are made of a steel frame made from recycled cars and covered in plastic topiary. the local community helped with the cladding and painting. The herd consists of 13 elephants, the leader Tusker is 11 ft tall and he is followed by a range of adults and babies. They began their tour in May in Inchydoney,West Cork, perched on a headland looking out to sea and must have looked splendid. The Survival Tour came from an idea by the conservation charity called Elephant Family and the Royal Parks Foundation and The World Land Trust. The aim is to raise funds to help to purchase a 6.5km by 1.5 area in Kerala in India which connects two key pockets of forest. It will provide a safe migratory route for up to 3,000 Asian elephants. The loss of so many forested areas in India may well lead to the extinction of the elephants, tigers and other animals that are teetering on the edge of extinction. The tour takes in Dublin (in the Pheonix Park),then to England to Windsor, Royal Parks in London, Selfridges department store in London then back to Ireland to an arts and music festival in Co Laois and finally in September they move to Brighton, England. 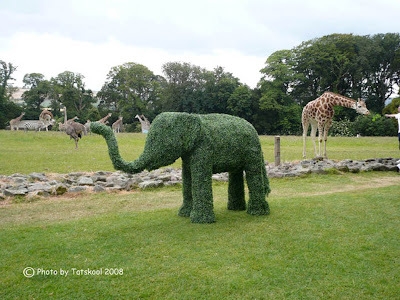 Before we had chance to see them in West Cork, just as we were about to go on holiday we heard that they had come to our Wildlife Park at Fota for just two days. No time to spare but I had to see these elephants and I was not disappointed, there they were under the large trees in the middle of the park. This is me just to give you an impression of the size (and yes I am wearing blue! )and this isn't even the largest elephant. 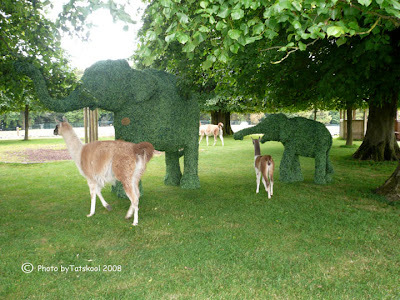 We don't have any elephants in our Wildlife Park, each 'zoo' in Ireland specialises in breeding certain animals. So it was super to see the elephants with the other animals in the back ground, our giraffes, zebras and ostriches. The alpaca herd like so many of the animals are free to wander in the park and were not impressed by the elephants. Too many photos I know but it was hard to choose. Take a closer look ot the plastic clover like foliage on this display. 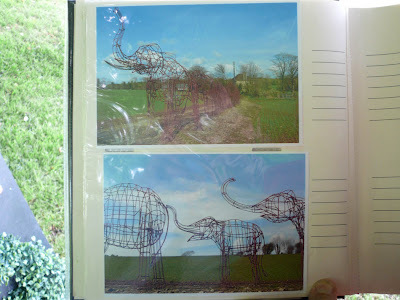 The photo album showed the construction of the elephants. 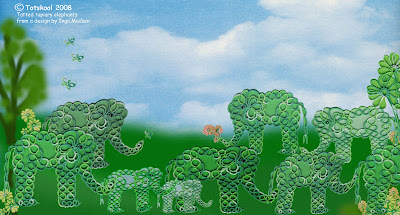 With a lot of help from photoshop here is my tatted impression of the topiary elephant herd. More info and super photos of the Survival Tour are here and here for a fabulous flickr slide show. Meanwhile in the Wildlife park it was just another day for the animals. 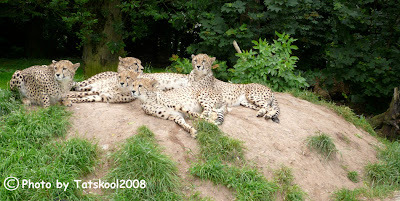 We have a large breeding population of cheetahs. 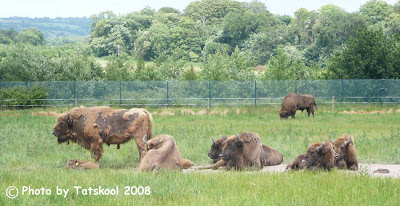 We also breed European Bison, some of which have recently been returned to Poland to the wild. We have recently had a baby pure Rothschild's Giraffe born. 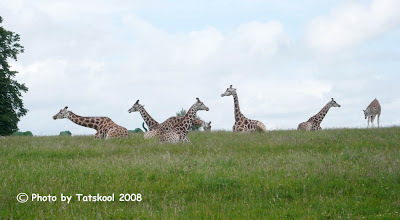 Most giraffes in captivity are hybrids. You can just see the elephant herd in the background. Hope you enjoyed this little peep into the world of green elephants! I have been away in England for a coupla weeks that's why there has been no activity on this blog. But while my back was turned I have been nominated for two awards so my head is swelling rapidly. I was tagged by Carol to tell some unimportant things about myself..but...there is absolutely nothing unimportant about me!!! so that's a tricky one and anyway I have been tagged before way back in the annals of this blog....well I'll think about it... thanks Carol anyway. 1. We once had a chamaeleon that broke it's arm so we made a splint out of 2 matchstick bits but it didn't heal well, tried again with 2 pieces of aluminium bent into an L shape and the arm healed a treat. Am I the first tatter to put a splint on a chamaeleon!!!!!!!!!! Do I got an award for that??? The Chamaeleon was pretty pleased! 2. My Car is the most divine purply blue called Lapis Lazuli, it makes me feel happy every time I get into it. 3. My eyes are blue and if I am not careful all my clothes would be blue, I have to make a real effort not to pick blue. 4.Even the tubs in my front garden are blue and co-ordinate with my car. 5. My first pair of good spectacles at 17 were turquoise blue, I wore them for 10 years, I look back at them in horror! Everyone I know has already been tagged so I think I will pass on that. But this is the BIGGY!! I have been nominated by Carol for the Arte y pico Award and also by Laura. Arte y pico Awards originate in Spain and are given to blogs for their creativity, design, interesting material, and in recognition of their contribution to the blogger community. Cool or what! 1) You have to pick 5 blogs that you consider deserve this award, creativity, design, interesting material, and also contribuites to the blogger community, no matter of language. I use google reader to manage my favorite blogs and have 57 in my list and now I am expected to choose my 5 favorites!! Impossible I love 'em all. These then must the ones I look at first when I have been away and come back to find dozens of blog updates. So for their entertainment value, tatting content and ability to pick me up if I am feeling low I nominate...yes I know many have been nominated before but that just goes to show how good they are!! and an extra one! for good luck! Please note that these favorites are frequently exchanged for other favorites, nobody must feel left out! Why do you keep making me choose. All 57 are fab' or I wouldn't have them in my Google Reader.